The swimming pools & patios we design and install in Mooresville, NC are known for their exceptional quality and stunning aesthetics. Swimming pools & patios are one perfect combination that can’t be denied. If you’re interested in enhancing your outdoor living space with a stunning pool and patio, at Chad Goodin Signature Homes, we want to help. 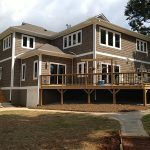 We have been designing and installing swimming pools & patios in Mooresville, North Carolina and the surrounding Lake Norman area for several years now, and are known for the quality of our workmanship. We believe that not only can an exceptionally designed swimming pool and patio help you get more out of your outdoor living space, but both of these features can also dramatically add to the value of your property. We guarantee we won’t move forward with any design plans until you have reviewed them and confirmed they meet your expectations in terms of functionality and aesthetics. Although the design and construction of our swimming pools & patios is overseen by our sister company, Lake Norman Signature Swimming Pools & Patios, you can expect nothing less than exceptional workmanship. Their services are simply an extension of ours, and we promise you will receive the same great service you are accustomed to receiving from our professionals. If you are ready to turn your backyard into the oasis you’ve always dreamed of, get in touch with us at Chad Goodin Signature Homes today to find out more about adding a swimming pool and patio to your backyard. We look forward to hearing from you and to helping you with every aspect of your project from start to finish. At Chad Goodin Signature Homes, we can build beautiful swimming pools & patios in Mooresville, Cornelius, Davidson, Huntersville and the surrounding Lake Norman area of North Carolina.